Microblading can be referred to under many different names; eyebrow embroidery, eyebrow tattooing. 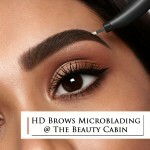 The Beauty Cabin offers the full range of High Definition Brow services with HD Master Stylists available at our salons in Biggleswade & Cambourne. The Russian Layering & Varia Techniques (also known as Russian Lashes and 3D-6D lashes) originated in Russia and have recently made a breakthrough into the US and Europe. Online Booking App – NEW!!! Book your next appointment with your preferred therapist and at a time convenient to you via our NEW Mobile App.....DOWNLOAD IT NOW!! !